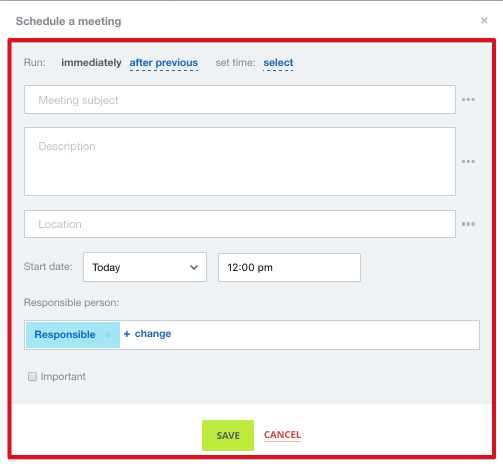 Bitrix24 new automation rules are designed to help you automate work with CRM records (leads & deals). Use automation rules to streamline client management process and help employees adhere to lead processing algorithm. 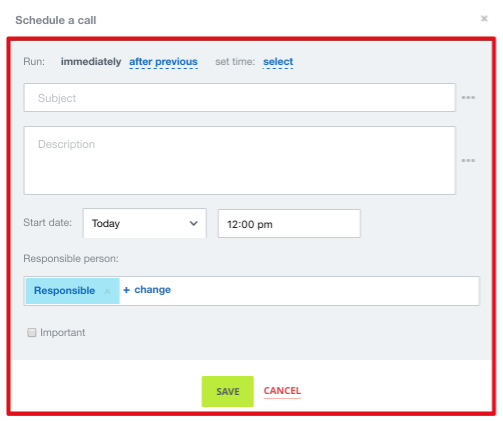 Automation rules will perform actions in an unattended manner: send e-mails, make calls, etc. ● After previous - this parameter helps to build logic actions chain of actions, when your rule shouldn’t be activated before the previous rule is applied. For example, you need to call your client after an email is sent to make sure it was received and read. If email hasn’t been sent, the call won’t be scheduled. Delete – rule that deletes CRM record (lead or deal) when applied. Usually this rule is used for unqualified leads, which are considered as junk leads. 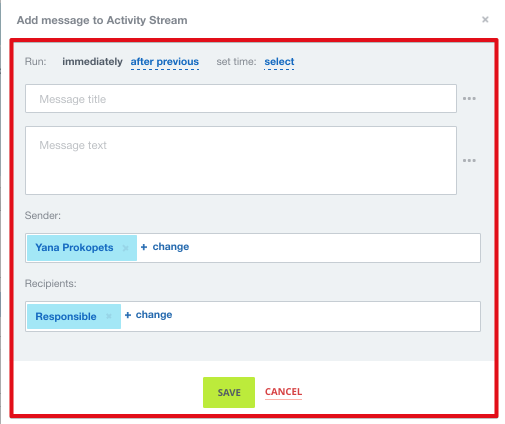 Notification – this very useful parameter can be configured to send your sales agents reminders what actions should be performed during lead processing. You can add notification description (e.g. what should be done at this step) and configure who will be shown as notification sender. 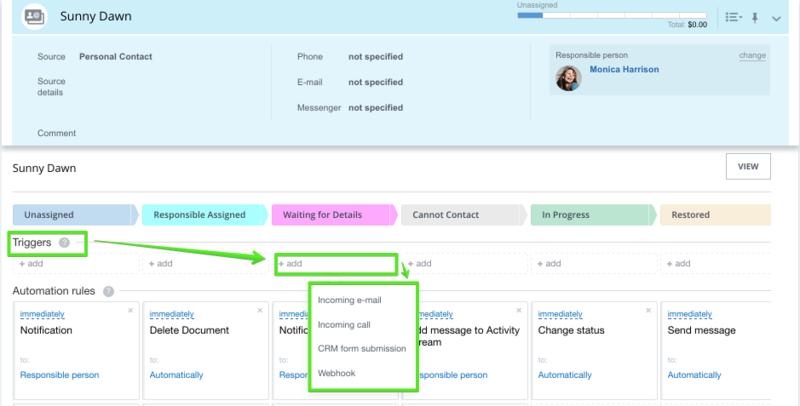 Please note that notification rule is configured for all CRM records types generally (e.g. for all leads) – it is more convenient to leave recipient filed = responsible. In this case the system will identify record’s responsible user and will automatically send him or her this notification. 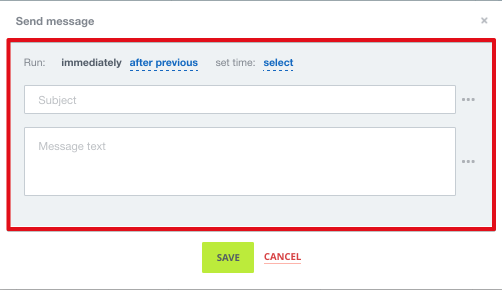 Change status (stage) – if your lead processing method is rather simple, then you can automate it even more – change record’s (lead or deal) status (or stage) automatically after certain condition has been met. Advertisements - these are rules that automatically send client data to the target audiences and remarketing lists in various ad networks. Please note that this rule only sends the information about the client (email or phone). You should have the ad configured inside selected advertising platform first. You will need to add your advertising network’s authorization details to Bitrix24 rule settings page and configure further available parameters. Facebook and Google advertisements are coming soon. Send message - this rule automatically sends emails to your clients. Just add message title and text. 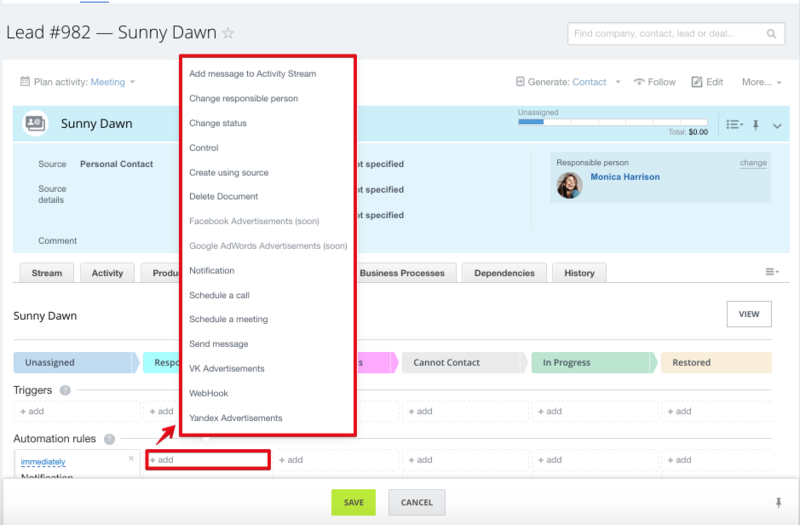 Control – the rule helps you to control CRM record's progress within your sales funnel or deal pipeline. 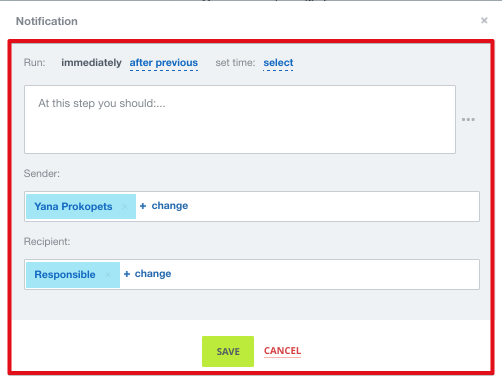 For example, you can set a rule that a lead can stay unassigned (status=unassigned) for a maximum of 3 days. You can add rule for this status notifying you that the sales agent hasn’t yet changed lead status. 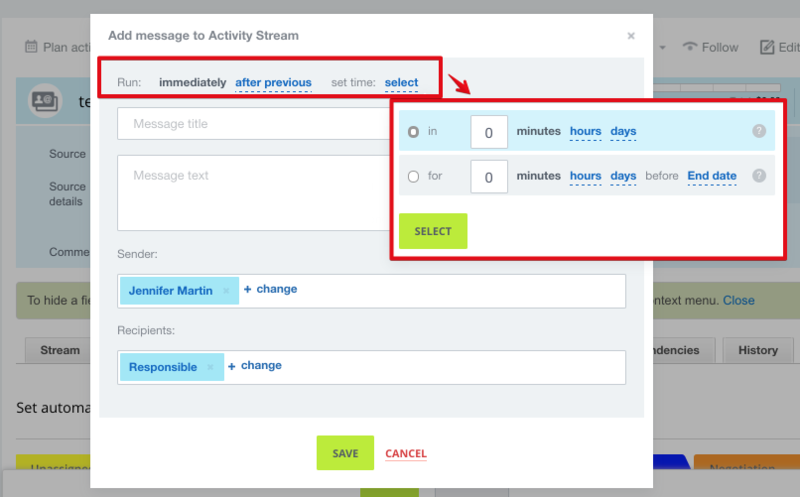 This type of rule allows you to control each CRM record’s (lead or deal) stage\status and will automatically notify you when your team is falling behind. Schedule a call – rule will automatically schedule a call and will notify your sales agent that he or she needs to call the client. Webhook – this rule helps to send data to any other system. Webhook manual is coming soon. Triggers - client side actions that will bring status processing into motion. When a trigger sets off, the CRM record will be brought to a required status, which in turn will activate appropriate automation rules. This options is available for Bitrix24 Plus plan (leads only), Standard & Professional plan (leads, deals) subscribers.